Fall is my favorite season of the year. I really love the crispness in the air and the warm colors. Today's card was made for Curtain Call - Going Batty. I don't own many Halloween stamps. 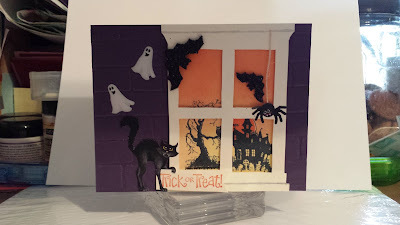 2 from Stampin' Up! I think. But I have some stickers. So I stamped the haunted house and spooky tree from one of my sets in Staz-On black. Then with my sponge I added background color. Then I traced a window from another project and cut the panes out. Added the stickers and my stamped sentiment. I used the brick wall embossing folder from Stampin' Up! on my purple card stock. Drop by Curtain Call and play along.